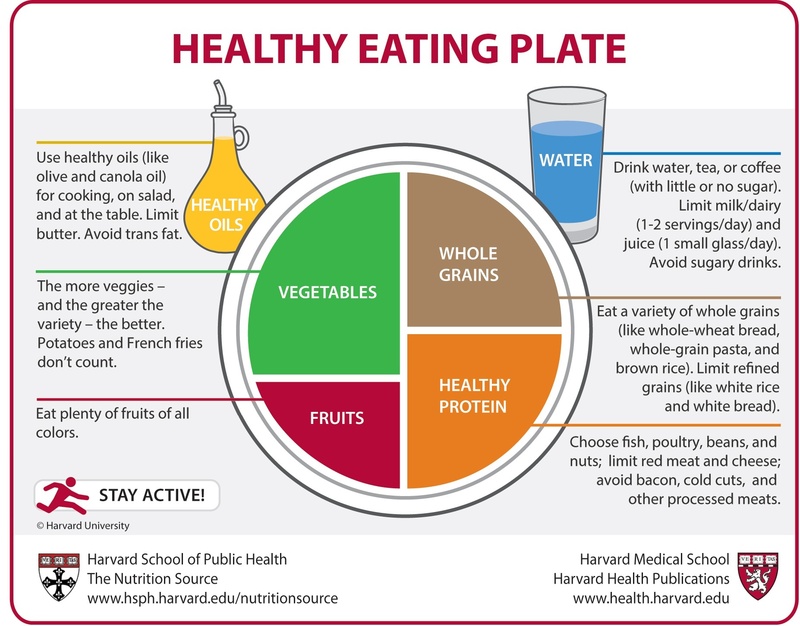 Use The Healthy Eating Plate as a guide for creating healthy, balanced meals. Nutrition and diet information is constantly evolving, but here are some nutrition basics to keep in mind. Serving sizes can help you determine more appropriate portion size, and learning what the standard serving sizes are can help you better estimate how much food and how many calories you are eating. Portion distortion – massive servings of food we get at restaurants, and maybe even at home – is commonplace, and most of us probably don’t know what a true portion size looks like. Learn more about portion sizes. Portion control is one of the keys to a healthier diet and a healthier lifestyle. Eliminate the confusion and gain some control! Aim for color and variety, and remember that potatoes don't count as vegetables on the Healthy Eating Plate because of their negative impact on blood sugar. The red figure running across the Healthy Eating Plate's placemat is a reminder that staying active is also important in weight control. Learn about MacroNutrients and MicroNutrients and for more information on healthy eating.